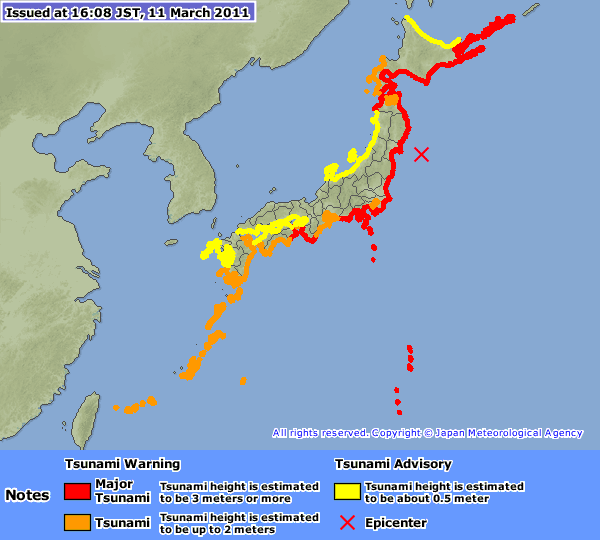 Earthquake, Tsunami Warnings in Japan | This Japanese Life. Posted on March 11, 2011	by E.
I’m in the yellow area in the center of the map, near Korea. So, we’re OK.
Japan has also designed the first early-warning system, which (frustratingly) can only tell you that there will be an earthquake – not when or how severe. That said, nothing really keeps you safe from the earth shaking for 7 minutes, especially if nature has designed a system that follows it up with monstrous waves. The footage of the waves moving through farming villages is actually sickening to see. While most people in these areas had about 2-4 hours warning of the impending tsunami, they were still left to grapple with leaving the area on roads with holes the size of cars, landslides and debris. One report says that 200 bodies were found on the shore where the tsunami came into land. Power for 4 million is out as of 6 p.m., the bullet train and airports have stopped. There’s reports that additional waves are on their way; even six hours after the initial earthquake, Twitter is still buzzing with news of additional tremors in the area. There had been five earthquakes in Japan over the last three days – which made it remarkably difficult to know which one people were talking about when I got e-mails from the states today, given the time and media lag on international scales. You can hear the sound in the videos as houses, swept up in waves, collide and obliterate each other: A chime telling the kids that it’s time to go home, it’s late. After Disaster, Laundry: Why the Japanese went back to work. Explaining Fukushima to a 12-year-old: My grandfather built nuclear power plants in Japan. Here’s how he explained them to me as a child. On Ruins: Japan’s strange relationship with sacred debris. (Written pre-Earthquake). This entry was posted in Earthquake, Video. Bookmark the permalink.